Beautiful Avon Plate, "Trimming the Tree". In original box. Buyer to pay shipping. Sorry the picture isn't better. They don't scan well. Thanks for bidding. 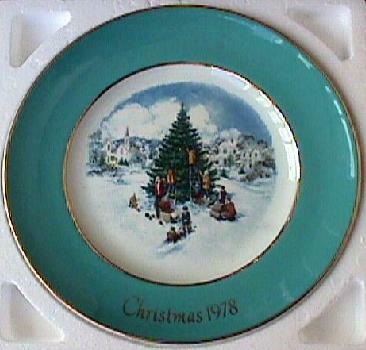 THIS IS A 1978 SIXTH EDITION AVON CHRISTMAS PLATE, TRIMMING THE TREE. NO BOX, BUT EXCELLENT CONDITION. SEA GREEN COLOR EDGE WITH PICTURE OF MANY TRIMMING THE CHRISTMAS TREE. CHECK OTHER AUCTIONS FOR MORE AVON CHRISTMAS PLATES. COMBINE ON SHIPPING. HIGH BIDDER PAYS SHIP/INSUR.